Streetlethal was my first purchase from Borderlands Books in San Francisco. 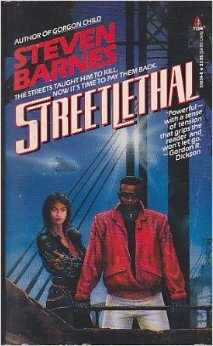 🙂 I’d already become a fan of Steven Barnes’ books Lion’s Blood and Great Sky Woman (I checked them out from the public library), but I’d never heard of Streetlethal until I saw it while browsing in the bookstore. I bought it and another of his (unknown to me) books, The Kundalini Equation. Streetlethal takes place in a somewhat dystopian future Los Angeles. The story centers around Aubrey Knight, a highly skilled nullboxer (nullboxing is like MMA to the nth degree) who becomes an enforcer for the Ortegas, a powerful drug family who also dabbles in black market organ selling and prostitution. Aubry is set up by his new girlfriend/drug addict (guess who is her supplier?) because he wants to quit working for the Ortegas–which is not done–and sent to a maximum security prison for murder. He eventually escapes and goes after Luis Ortega, the man who orchestrated his set-up, which is how he meets Promise–a woman who had taken Aubry’s ex-girlfriend/snitch under her wing and got her into rehab. Promise becomes Aubry’s “in” to the Ortegas, with interesting results. The technological advances in the novel are quite mind-boggling, especially considering that the book was written in the early 1980s. Barnes’s gift is showcasing the range of human emotion in all of his characters. In Aubry Knight and, eventually, Promise, we get everything from euphoria/”top of the world”; to the depths of despair when your world is snatched from beneath your feet; to the unique mindset of athletes, especially professional ones; to the confusion and borderline resignation when things don’t quite work out the way you’d planned. In his strong secondary characters (Tomaso Ortega and Kevin Warrick are excellent) we get the roller-coaster ride of power plays, drug addiction, insecurity, family dynamics, and the urgent drive that comes from feeling like time is running out when you have too much to do. It’s also nice to read a post-apocalyptic novel that doesn’t include zombies; then again, zombies weren’t as much of a thing in the eighties. I missed the memo that Streetlethal is the first in a trilogy (it pays to read those last few pages of advertisements in a book), and that Aubry’s journey continues in Gorgon Child and Firedance (that has been rectified–thank you, Amazon used books). Fans of dystopian stuff, martial arts, science wonks, and diverse sci-fi/speculative fiction would enjoy this novel. Whee! Went on a nice writing tear to push myself a lot closer to the 30,000-word mark. I’m back on target! It was a nice achievement on an otherwise lazy day. I wrote until I ran out of steam, and now I have to figure out where I want the story to go next. I’m torn between a totally outlandish plot development and a more conservative one. I’ll probably end up going for broke, and going all the way “out there”. While I categorize the book as a thriller/suspense novel, it does contain some elements of speculative fiction. It’s kind of fun to sit and think of things I’d like to see happen as technology becomes more advanced and more integrated into our society, and write them into existence. Perhaps one day, life will imitate art (but only for some parts of the novel! ); for all I know, some of the things I create in this novel are being worked on, as we speak, in some underground, tricked-out laboratory bunker somewhere. Anyway, time to relax on this rainy evening with a nice ebook, while I keep an eye on some basketball games (gotta get NBA League Pass next season!). Keep plugging on your books, blogs, or both. Again, no video, so you’ll just have to read again today. 😀 (It’s kind of tiring to tape oneself every day. How do selfie aficionados do it?). I broke the 15K mark today with 1,721 words, which brings my total to 15,833. I had to really push myself today to make my word count. Part of it was that I’d spent most of the day laying out my upcoming book, Blizzard (written under a pseudonym), and submitting it to CreateSpace. I didn’t have that much energy left (it’s a process), but I managed to get my word count in. Today, my characters were arguing/fighting. Yesterday, I posted about a character’s shattered reality. Today, I went further into that shattering, into the anger part: the characters are lashing out at each other, trying to find a reason, some blame–something concrete onto which they can hold, so that the madness is less frightening. Maybe that’s another reason I feel so drained: writing all that anger and angst is not healthy, especially when I don’t have any going on in my own life. I also started the events that lead up to the conflict, which will require some more belief suspension. But that will happen tomorrow. I hope your weekend is going well, and that you are making progress on your writing, blog, or both. Happy Friday! And Happy Day 7 of NaNoWriMo/NaBloPoMo! Can you believe it’s already been a week! Seven whole days…WOW. No video today, and just a quick blog post, ’cause I’s dawg tired, Boss. I have gotten over 14,000 so far: that’s a good feeling. When I was writing today (after finishing the final touches on the final draft of my new book, Blizzard, which comes out next week), I found myself entering the realm of disbelief. This is where the speculative aspect of my book comes in: I took a premise and ran with the “what-if”ness of it. I had some fun just gong with the flow, and got some amazing dialogue as a result. I hope everyone is plugging along on their book, or blog, or both. Keep up the good work, and enjoy your weekend! Happy Voting Day! Here in the United States, it’s Voting Day. This is considered Midterm Elections, being that it occurs midway through the presidential term. It also tends to be a period of low voter turnout, because most people don’t see midterms as important as the presidential election. But since political figures who impact our lives on a more day-to-day basis tend to be elected during midterms, they are as important, if not more, than a presidential election. So if you haven’t voted, please do so if your polls are still open. I don’t care who you vote for–just vote. People died so that you could. Okay, that’s my public service announcement (PSA) for today. 😀 Back to the matter at hand: NaNoWriMo! My writing today involved character motivation. I know why my protagonist does what she does, and that’s pretty obvious. What wasn’t obvious was that of my protagonist (or anti-hero: haven’t decided which he will be yet). When I put it on paper today, it made things a lot clearer and gave me some additional options for furthering the plot. It’s always important to make your character’s motivation clear. It helps you, as a writer, get your plot right; and it helps your readers engage with the book. If your readers don’t get why a character is doing something, the plot falls flat, they don’t like the book, and they don’t buy the book. Which is not good. Because I am writing a medical thriller, I think of the two best examples of medical writing in the past few decades: Robin Cook, and the late Michael Crichton. Cook wrote the seminal medical thriller with his first book, Coma (which was made into a movie) and wrote dozens more. Crichton was the creative and writing force behind this little medical show. Maybe you’ve heard of it: it was called ER. 😀 He also wrote this movie and book called Jurassic Park, as well as the cool medical thrillers A Case of Need and The Andromeda Strain. Anyway, I hope that you are making progress on your writing, or blog, or both. Keep on truckin’! I mentioned in a previous post that I am participating in the Clarion Write-A-Thon. It runs from June 22 – August 2. Day 1, which was yesterday (6/22), fell on a day when I was relaxing, so I did nothing but binge on past episodes of Royal Pains. 😀 Today, Day 2, I got back in the saddle. I updated my writer profile so that I can keep abreast of my writing project, and I dug up my project. For this go-round, I decided to do only 25,000 words. The contest runs over 35 days, which means that I will need to write at least 715 words per day to meet my goal. I have several unfinished sci-fi-/speculative fiction things that are languishing in storage, so I dug them out and looked them over. While I haven’t decided if I’m going to do a full novel or a collection of short stories (I have both), I do know that this Write-A-Thon is going to be a serious challenge, no matter what I write. Sci Fi is not my gift. I like to read it (or rather, I like reading speculative fiction better than hard-core sci fi), I admire those who write it, but I’m not one of those who can do it easily. I have tried writing short stories (a format which is also one of my writing weaknesses), and submitted them to big dogs like Asimov Magazine and Lightspeed, only to get rejected several times (hey…go big or go home, right?). So to actually enter the Clarion Write-A-Thon is either a testament to my desire to get better as a writer, or an aspersion on my sanity. Anyway, I am revisiting the theme of what was supposed to be a novel, and started over. I like the changes that I’ve made so far and I’m excited about where it’s going, even as early as it is in the game. Today I finished 1,196 words. Yay me! Now…back to the final edits of my upcoming October book. No rest for the weary!